Don’t miss Laughing for Life III. This event is held at Level 5 City Stage and is hosted by Timmy Sherrill, owner of Nutt Street Comedy Room in downtown Wilmington, NC. 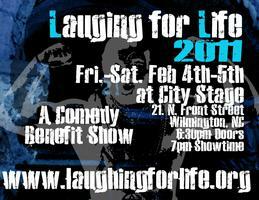 On February 4th and 5th, 2011 at 7pm the laughs begin with a great line up of comedians from around our region all coming to Wilmington to support this great cause.. Laughing for Life is a charity comedy show that raises money for the Lo-Tide Run; a charity event held on March 19th, 2011 here on Carolina Beach, North Carolina. Check out the list of comedians participating and order your tickets on-line for this event from Laughing for Life III. This entry was posted in Wilmington, Winter Events by admin. Bookmark the permalink.